I need to know how to lose 20 pounds in 3 months – Now! How many times have you wondered how to lose 20 pounds in 3 months ? Or have you said in frustration to whoever will listen “It is so hard to lose weight, I hardly eat anything!” Is it really easy to lose 20 pounds in 3 months? I know how you feel. I have struggled with overweight and obesity since the age of 10, pretty much all of my life. It took me 50 years to make some sense out of the confusion. I'd hate for you to have to wait that long. The shocking truth is that losing weight is not as complicated as you think. Your body is always trying to get healthier, if you just let it. You do not need any magic potions or shakes to lose 20 pounds or more. Nor do you need special meals delivered to your doorstep. I will give you the simplest and best ways to lose 20 pounds in 3 months. You do have to put in effort to achieve your weight loss goals, but not as much as you think. This is the exact same plan I used to lose 20 pounds in 3 months. I developed the Hashi Mashi Diet & Training™ to help you do the same. I imagine you have wanted to get into better shape for a long time now. For many people, each year after the age of 25 means additional pounds, and they add up. You want to get healthier and fitter, but, you have no idea where to begin. Is there a ‘recipe’ for improving your health and fitness? I believe the answer is yes, and it is not as complicated as you think. No matter what shape you are in now, do not give up. It is never too late to get back into shape, no matter what your age. Whether you are a beginner in fitness, or a former athlete, along the way of life, many of us put on 20, 30, 50 or more pounds over the years. And we have no clue how to lose the weight, melt the belly fat and get back into shape. Obesity is one of the few preventable risk factors for cardiovascular disease. And there are many people who do not even realize that they are obese. A body mass index (BMI) over 30, or waist measurement over 40 inches for men. A body mass index (BMI) over 30, or waist measurement over 35 inches for women. You can now track your BMI on your phone with Bluetooth technology. Obesity is also defined by the National Academy of Sports Medicine (NASM) as a person who is at least 30 pounds over their recommended weight for their height. Do you know your ideal body weight? Here is a simple formula to help you determine the recommended weight for your height according to the Hamwi method. The ideal body weight formula is 100 pounds for the first 5 feet of height, plus 5 pounds for each additional inch. You can now easily calculate your approximate ideal body weight based on your height using the Hamwi method. Here is an easy way to measure your weight loss progress on a daily basis. You cannot control age or family medical history. But you can control what you eat and if you exercise. Being overweight or obese increases your risk of developing high blood pressure. In fact, your blood pressure rises as your body weight increases. Losing even 10 pounds can lower your blood pressure—and losing weight has the biggest effect on those who are overweight and already have hypertension. Losing 5% to 10% of your body weight and building up to 150 minutes of exercise a week may help you to slow or stop the progress of type 2 diabetes. With weight loss, you can slow down or even stop the progression of type 2 diabetes. You may be able to reduce cholesterol levels significantly by losing 5% to 10% of your body weight, according to the Mayo Clinic. Healthy weight is so important for overall heart health, that the American Heart Association and American College of Cardiology released a new report calling for physicians to create customized weight loss plans and recommend counseling with a dietitian or certified weight loss professional for at least six months. 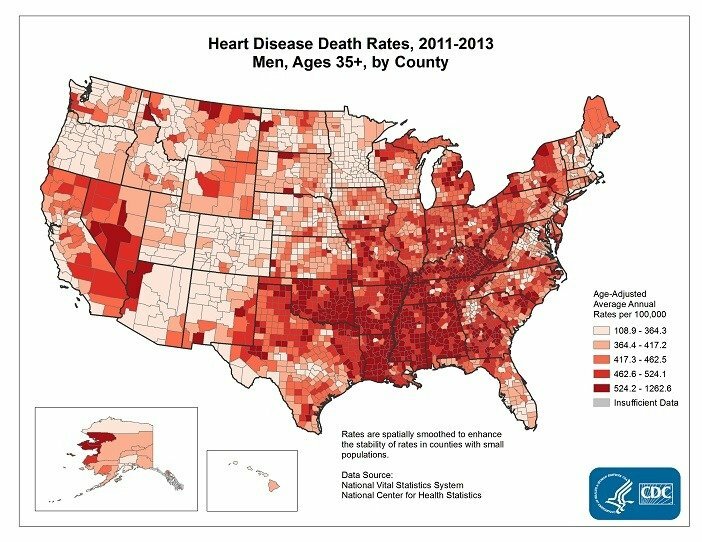 Now look at the incidence of cardiovascular disease in the US as illustrated in the second graphic below. 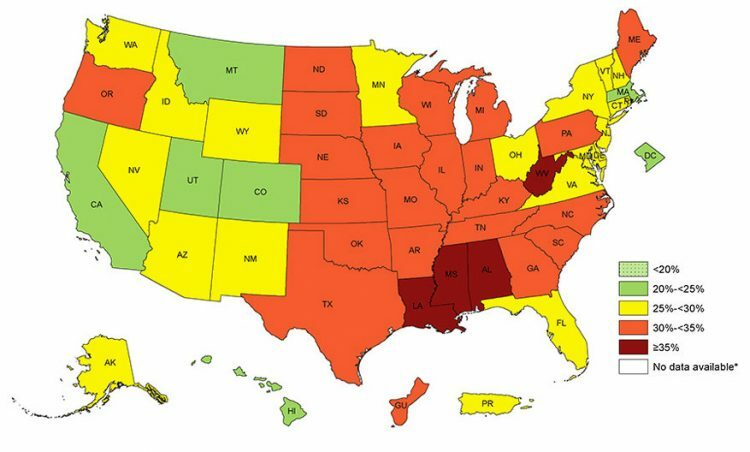 You will see a striking resemblance in the states where obesity and heart disease are most prevalent. Why The Big Focus On Weight Loss In America? Now we understand why we are so focused on losing weight. We know intuitively that a healthy weight is more likely to produce health. Losing weight is going to help you avoid type 2 Diabetes, hypertension, high cholesterol and a lack of physical activity. Once you are at a more comfortable weight, it will be much easier to exercise. If you are a man over 45 , or a woman over 55 , then you already have one risk factor for heart disease, the main killer of men and women in the United States. This is why getting your weight under control is so critical. Fear is a great motivator, and fear of all of the complications brought on by obesity is real. Now that you know some of the negative effects of excess weight, there is no reason to be despondent. The great news is that your body is always trying to attain a state of health and fitness, if you just let it. My intention is to help you learn or relearn how to lose 20 pounds in 3 months. 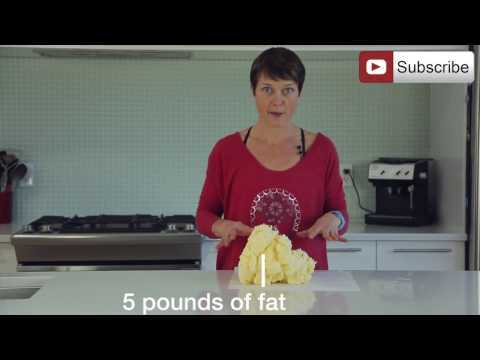 Even losing 5 pounds of fat is a big deal – (see what 5 pounds of fat looks like in the video below). After your first 20 pound weight loss, you can repeat the cycle if you have to lose more weight. Remember, this is not a diet as in a temporary fix, the Hashi Mashi Diet and Training™ plan is a system for long term transformation, new habits that you will stick to for the rest of your life. Why Is It So Hard To Lose Weight Over 50? Small steps, new lifestyle habits, one after the other will bring you to your destination. These small changes will result in a major transformation. Losing 20 pounds over the next 3 months is within the healthy guidelines of 1/2 – 2 pounds of weight loss per week. But, do not push yourself to lose more than a pound or two each week. As soon as you settle into this system, your body will work it's magic and release the right amount of fat. The first step is to establish a routine of eating healthy meals 3 times a day as well as at least one snack. Excellent eating habits means that you must establish a regular meal pattern. This is the first way how to lose 20 pounds in 3 months as I describe below. A foundation of consistent fat loss is having a regular meal pattern. Some people think that going low carb is the pillar of fat loss. Others think that starving themselves, such as intermittent fasting is the best way to lose weight. Everyone has an opinion on how to lose weight. Does it make sense that weight loss seems to be more complicated than rocket science? Of course not. So, let's simplify the easy steps that you can take to transform your body from fat to fit. First and foremost, ground zero is to know your starting weight. Depending on your starting weight, you can lose 20 pounds in only three months. If you are only 30 pounds overweight, you will see great results in 3 to 4 months. You can absolutely lose 20 pounds in 3 months. For 50 or 60 pounds, you are looking at 6 to 7 months. In a 12 week period, it is reasonable to lose 8 pounds every month, which is within the guidelines of 1/2 to 2 pounds a week. Meaning, you can expect to lose up to 24 pounds in a month. You do not want to lose more than 2 pounds a week. One pound a week is great too! Your first small step is to establish your meal routine. Remember, do not attempt to lose more than 2 pounds a week. Even one pound a week is a great success. Why is a Regular Meal Routine so Important? When you skip meals, your body gets distressed. Skipping meals is not the way to lose weight and certainly not fat. By skipping a meal, your body does not know when the next meal is coming. As a result, your body will hold onto your fat reserves very tightly. Just one pound of fat in your body, stores 3,500 calories! Your body will not release that fat if your body believes that it needs to hold onto the fat. Instead, your body will take some of your muscle reserve, which is more expendable. Muscle is your friend, but also very expensive for the body to maintain. One pound of body fat only requires a few calories a day to maintain, whereas a pound of muscle can require between 50 and 100 calories. As a result, your body would rather hold onto body fat instead of muscle. Unless you teach your body that it is not necessary to hold onto your body fat. You do this by teaching your body that it will be fueled every few hours. By eating regular meals, every day, you stabilize your blood sugar and your body gets used to your pattern. Whatever you demand from your body, your body will adapt. Like a magic genie (within human reason of course!). 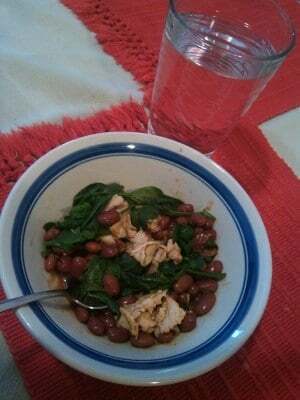 Establish this regular meal pattern of healthy eating habits. By eating regular meals, your body will be more willing to release your fat. 3 meals and a snack worked wonders for me. I lost 20 pounds in 3 months and 75 pounds in 6 months, and a total of 100 pounds over the course of 15 months, approximately 1.5 – 2 pounds a week. Five years later in 2018, I continue to maintain this weight loss. You have to experiment a bit to see what works for you. But clearly, having a regular meal routine is the foundation of your transformation. You might just need 3 meals and a snack or 2 snacks. Make sure that your body gets some fuel every 3 or 4 hours. You should never be feeling hungry. I know the temptation to fast and stop eating, thinking this will help to really get rid of fat. You might lose some water weight, but not fat. The water weight is lost from your cells as your body uses stored carbohydrate (glycogen) in your skeletal muscles which are bound with water molecules. So, you do not lose fat on a fast, you end up losing water and muscle tissue. Establish a regular meal pattern, 3, 4 or 5 times a day, so your body knows what time it will get fed. That is the first step to weight loss that is primarily from your fat. 2. Get Up and Move! Another pillar of effective weight loss is to start moving and burning calories. You must create a calorie deficit and expend more calories than you consume in order to lose fat. In order to lose fat, let's assume that you have already established your meal pattern, your daily eating times. Now that you have your regular meal times, you want your body to know that you need to burn more energy. What is the best way to do that? Is it by starving and eating less? The answer is no, because there is no reason or need to starve your body. Your body needs energy, your brain needs glucose to think, to remember and to learn. Is it by eating protein powders and not real food? I also say no, this is not necessary. The amino acids from protein powders if you use them, are going to build or repair muscle tissue. That is the main rationale for protein powders and meal replacements. And if you only use protein powders and limit carbs, you are going to be missing an important macronutrient (carbohydrates) that is the preferred energy source (carbs turn into glucose) for all the cells of your body. The best way to burn fat then, is by demanding more from your body in the form of movement. Your body is built to move. Sitting around all day just tells your body that all you need to do is to sit around. But, if you do 30 minutes of cardio 5 times a week, your body will get the message to start burning fat for energy. Especially if you do moderate intensity cardio, approximately 65% to 75% of your target heart rate. The point is that by asking your body to burn more calories through movement, this is the way to burn through your fat reserves. At the least, make sure that you are doing some sort of exercise 30 minutes a day, 5 to 6 times a week. You need to move in order to lose 20 pounds in 3 months. Whether the physical activity be cardio, strength or weight training. Answer this PAR-Q physical activity questionnaire to see if you are ready to exercise. Some people say that every diet and exercise plan can be reduced to four words, eat less, move more. While there is a basic truth to that idea, it does not give you a proper plan. Eat less, what does that mean to a person who is 30, 50, 60 or 100 pounds overweight? What does eating less mean to anyone is struggling with overweight, obesity and weight loss? Have you ever listened to a person who is trying to lose weight? Do you remember what they say? “I hardly ate anything today and I still cannot lose a pound!” Have you heard that line before, or have you said it yourself? Telling a person who thinks they are hardly eating anything all day to eat less is not productive. And suddenly your body says, “Ah, you are demanding more energy, no problem, I have stored fat and will release the energy from my fat reserves.” By building muscle in your strength training, you are also demanding a greater number of calories to maintain that muscle. However, the foundation of burning fat is by having a regular meal pattern to start. It is much more effective for your body to burn fat through movement (exercise, cardio, walking, running, lifting, swimming, stretching), than by starving your body with no food and no movement. That is just cruel to your magnificent body that just wants to keep you alive and does so by breathing you, and circulating your blood with oxygen and beating your heart, your entire life. So, the bottom line, is that on top of your regular meal routine pattern, now you establish a movement pattern, every day or at least 5 – 6 days a week. It is always a good idea to rest up your body at least one day a week, take a break. Now you have two pillars, regular meal pattern, pillar 1 and regular movement pattern – pillar 2. In the old days, people moved around all the time, farming, hunting, building. Today, modern life does not require a lot of movement, because we have transportation, no need to move, the car, bus or train will move you from place to place. Then there is entertainment, so instead of playing, we watch others who are playing or moving around on a screen, on a stage or in a stadium. The movement pattern that I suggest is 5 days a week of cardio, between 30 minutes to an hour maximum. If you do 30 minutes a day, that in fact, is the recommended guideline for an adult by NASM (the National Academy of Sports Medicine). For muscular strength and endurance, I suggest 2 to 3 times a week of strength training, which will hit your entire body at least twice a week. You should also do stretching on a daily basis for flexibility. Simply put, exercise is medicine. What do you eat? Where is your fuel? The preferred source of energy for your body is carbohydrates. Classic and traditional carbohydrates in many cultures are real foods such as vegetables, fruits, legumes and whole grains, which are great sources of carbohydrates. Rice is prominent all over Asia as a fuel source. In India, there is rice and lentils, also known as Dal Bat. In South America, common carbohydrates are sweet potatoes and beans or corn and beans. Europe survived and thrived on the white potato and buckwheat, also known as Kasha. The middle east has pita bread made out of wheat flour, and hummus, which is made out of chickpeas. In every culture, all over the world, the main source of energy for thousands of years has been either grain and/or legumes. This is besides the seasonal vegetables and fruits that were available in each geographical location. Stick to real food (as opposed to processed manufactured food) and besides exercise, food will also be your medicine. 3a. Carbs are Evil – Is That True? News flash – carbs are not evil. How many times do you meet someone who tells you they need to lose weight. And before you say anything, they say that is why they are not eating carbs. So that they can lose weight. The sad part of that story is that removing carbs from your diet is not the answer. I have experienced the same demonization of carbs. When I originally began what I named the Hashi Mashi Diet, I swore off carbs. Yes, I lost a lot of weight, but I also felt like I was very hungry. Even starving, and that cannot be healthy. On top of that, I did not feel strong. So, the Hashi Mashi Diet and exercise plan has evolved as I have learned more about exercise and nutrition. The solution is to have a moderate amount of food at scheduled times and move more. Yes, and even if you eat some carbs, you are still better off than the person starving him or herself from good fuel sources. You are not bad because you like carbs. Your body likes carbs because carbs are easily transformed into fuel for energy. Carbohydrates are broken down into glucose that provides energy for your cells. Believe it or not, your brain is the most energy-demanding organ, using one-half of all the sugar energy in your body. Brain functions such as thinking, memory, and learning are closely linked to glucose levels and how efficiently the brain uses this fuel source. You need glucose for your mind, to think, to remember and to learn as well as feeling good. The solution is in balance, not in extremes. Protein is broken down into amino acids. Amino acids are used to either build and/or repair muscle tissue. Protein is not for fuel. Do not eat protein for fuel. 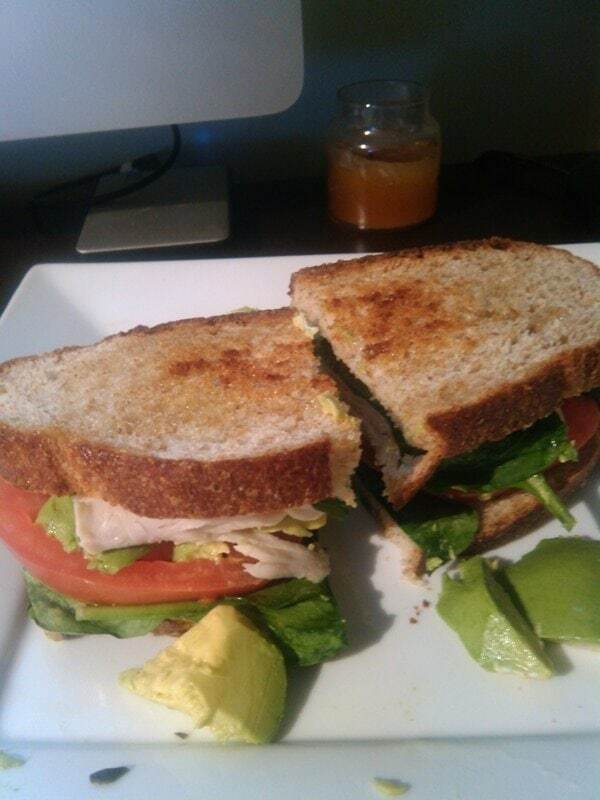 Eat protein to enable your body to build and repair tissue, that is it. Eat carbs for fuel and protein for tissue building and repair. Your body needs about 45 to 65 percent of calories as carbohydrate and 10 to 35% of calories as protein. The rest is from fat. You need approximately 0.8 grams of protein per kg of body weight. As your exercise level increases, so do your protein requirements. You do not need a protein powder for protein if you eat regular meals every day and include protein foods. For example, a cup of whole grain cereal like oatmeal has about 7 grams of protein, 2 tbsp of peanut butter has 8 grams of protein, a cup of lentils has about 16 grams of protein. The average woman for example needs approximately 46 grams of protein a day. A sedentary man on average will require 56 grams of protein a day. You can easily get 40 to 50 grams of protein a day through real food. And you do not need a lot of food to get your protein. Your typical protein powder gives you 20 – 30 grams of protein. Protein powders are good for convenience, but they are not required for fat loss. A cup of milk, a slice of bread and a tablespoon of peanut butter will also give you 20 grams of protein! Before breakfast, make sure to use a body composition scale to measure your weight loss progress. Between 7 – 9am have breakfast, whenever that works out. Somewhere between 12 – 1 have lunch. Between 3 and 4 have a snack. Somewhere between 6 and 7 have dinner. Stop eating after 7 or 8 pm, you do not need more food for your sleep in the evening. What to have for these meals? 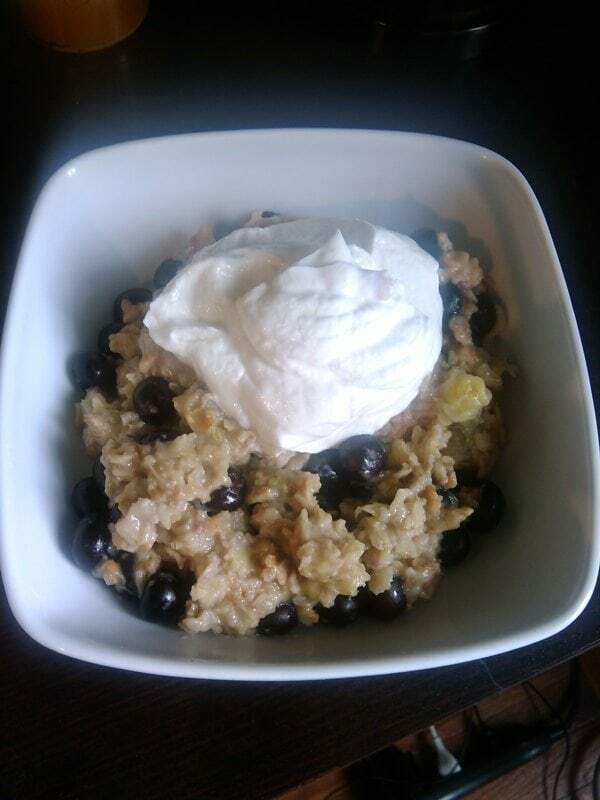 A cup of old fashioned oatmeal ( easy to prepare and filling ), some berries or banana. You can add a hard boiled egg. Or a banana, blueberries, grapes, walnuts ( a tablespoon or 2!) and a plain or vanilla greek yogurt (try to use a brand with low grams of sugar). Or a slice whole wheat toast, a tablespoon of natural chunky peanut butter, some slices of banana or strawberries on top. whole wheat pita, hummus, vegetables. whole wheat pita, vegetables like cucumber, tomato, pickle and a small can of tuna with tbsp of avocado oil mayo. vegetable soup with a cup of whole grain or bean based (non-gluten) pasta. 1/2 cup of brown rice, a SERVING of chicken/fish/meat, a vegetable….a serving is about 4 oz or the size of a deck of cards. sometimes there is no time to cook. easy to boil a sweet potato and have some vegetables and chick peas. Fruit in the morning – with a grain like oatmeal and/or if you want, a protein like an egg or yogurt. A vegetable and beans/chicken/fish in the afternoon, or grain and vegetable…even sushi, brown rice/avocado, rice and fish sushi. A fruit and/or some nuts for snack in the afternoon. A simple dinner at night. Do not eat after 7 or 8 latest in the evening as mentioned before. At night, there is no reason to eat. End of the day, sun is down, time to sleep, not eat. Drink water or lemon water or tea between meals….minimize drinking with meals. Of course minimize fried food unless it is a very special occasion. Shoot for 8 glasses of water a day. If you drink water, believe me you will be much less hungry…and many other benefits…! Having four meals a day makes it easy to get your 8 glasses. Have a tall glass of water 30 minutes to an hour before and after meals. That will work out to 8 glasses of water a day, perfect! Your stomach will let you know when your body is hungry and needs energy. But your stomach is not designed to be filled with endless quantities of food at one time. Eat up to 2/3 fill of your stomach. Your stomach is a little bigger than the size of your fist. This is why you want to keep the size of the food that you eat of any macronutrient to the size of your palm or so, you do not need more. If you eat a moderate amount every few hours, you will be shocked at how much your body will transform. You just need to give your body a chance to recover from the excess processed food and amount that we usually ask the body to deal with. The stomach is not built for a thanksgiving dinner every meal of every day. Establish your baseline – Get on a scale, know your weight, and mark it down today. Establish a set regular meal pattern routine, 3 meals and 1 snack a day, about 3 to 4 hours apart. Start moving, at least 30 minutes a day of moderate exercise, 5 – 6 times a week. Add deadlifts, squats, push ups and jumping rope once you have lost enough weight and can start weight training. As far as equipment goes, weightlifting requires a small area and a minimum amount of equipment available in most gyms that have free weights. Or you can set up a home gym in a small area of your basement or garage to lift weights with these tools for deadlifting and fitness. Real Food (not processed) is your friend, even carbs, just stick to real food. Such as vegetables, whole grains, legumes, lean protein, fruit, nuts and seeds. Use the Meal Template to create your own menu. Instead of ‘dieting’ and ‘restricting’, ‘Crowd out’ junk food by focusing on real food. Eat to 2/3 fill of your stomach. Overeating creates the state of overweight and is like poison to your body. And last but not least, don't forget to measure your body composition daily. If you follow these 5 steps, you will be surprised how great you feel after only 30 days, let alone three months. The Hashi Mashi Diet™ plan teaches you how to lose 20 pounds in 3 months. Invest in and help yourself maintain a healthy weight for your height long term. Please let me know of your results. If you have other ideas and/or experiences on how to lose 20 pounds in 3 months, please share. For email coaching, please contact us. |Next: Read How Often Should You Weigh Yourself for Long Term Weight Loss?